Archbishop Prays For 'Peaceful, Perfect End' For Nelson Mandela : The Two-Way The 94-year-old anti-apartheid legend and former president remains hospitalized in critical condition. A well-wisher walks in front of a wall in Pretoria covered with messages for ailing former South African President Nelson Mandela on Wednesday. Nelson Mandela remains in a South African hospital in critical condition. "May your arms of love, stretched wide on the cross for us, now enfold Madiba, and Graça, with compassion, comfort and the conviction that you will never forsake them but that you will grant Madiba eternal healing and relief from pain and suffering. "And may your blessing rest upon Madiba now and always. Grant him, we pray, a quiet night and a peaceful, perfect, end." 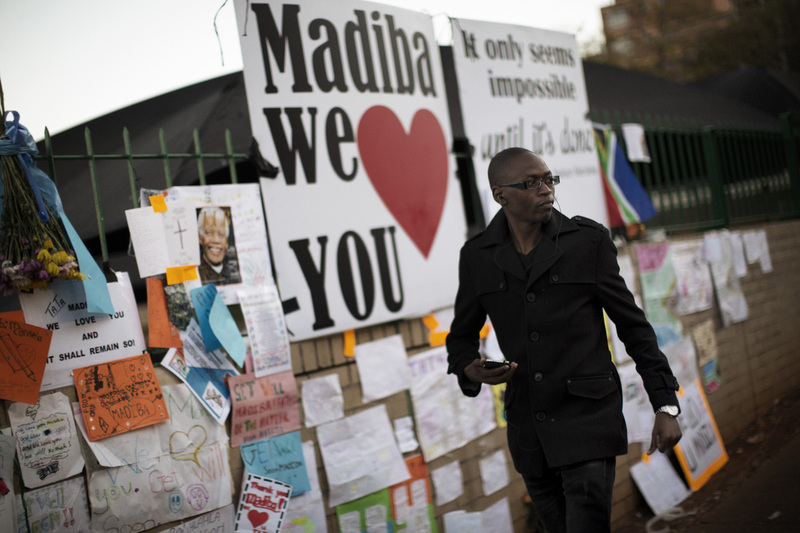 CNN reports that outside the hospital, the messages left for Mandela have shifted from hopeful to full of resignation. "Many of the messages appear to be written by children, in colored glue and pen, including one which features the hand prints of children still far too young to understand the indelible mark the former president has left on their country. "The touching and very personal tributes started appearing on the wall on June 8, the day Mandela was admitted to hospital for a recurring lung infection. However, what was hoped to be a short stint has stretched into its 19th day, the longest period of hospitalization ever for a man known not for his physical strength but personal fortitude."